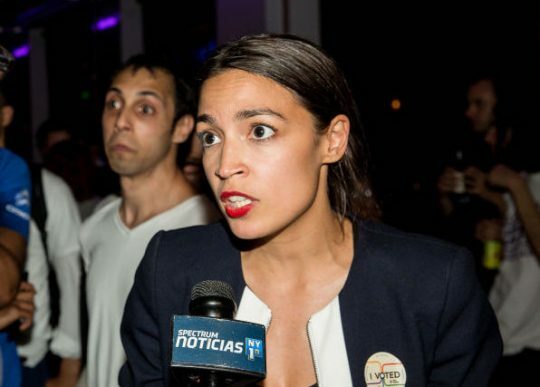 Democratic congressional candidate and self-described democratic socialist Alexandria Ocasio-Cortez was given the worst possible rating from fact-checker Politifact for a series of dubious claims about the unemployment rate. In a Friday PBS interview, Ocasio-Cortez dismissed the fact that the unemployment rate has steadily fallen over the past few years. "Unemployment is low because everyone has two jobs. Unemployment is low because people are working 60, 70, 80 hours a week and can barely feed their family," she said. The remarks were immediately criticized by journalists who pointed out they didn't reflect how unemployment actually works. The unemployment rate is traditionally measured by the percentage of the workforce who don't have any jobs at all. How many hours employed Americans are working doesn't affect the unemployment rate one way or the other. But Politifact's fact-check noted Ocasio-Cortez's other claims were also way off. "Everyone" doesn't have two jobs, less than 5 percent of the workforce does. The percentage of workers with two jobs under Trump is also well in line with the Obama years, and lower than it was during the Bush and Clinton years. The contention that people were working "60, 70, 80 hours a week" was "equally dubious," according to Politifact. "The people who might be working 70 or 80 hours a week amount to a tiny percentage of a tiny percentage — 310,000 people at most in a pool of employed Americans totaling more than 150 million," it noted. "It’s also worth noting that on average, Americans aren’t working more today than they have been in the recent past," Politifact continued. "The average number of hours worked in the private sector has hugged tightly to about 34.5 hours a week since 2006, except for a dip during the Great Recession." The fact-check, citing Gary Burtless, an economist with the Brookings Institution, also pointed out that "both of the factors Ocasio-Cortez cited — people working multiple jobs and long hours — are actually good things for the labor market." "Increases in the number of multiple job holders and longer average work hours almost always accompany a strengthening labor market — that is, a job market in which it is easier to find work, in which spells of unemployment are heading downwards, and in which the ranks of the unemployed are shrinking," Burtless said. Politifact gave Ocasio-Cortez its worst rating, "Pants on Fire," explaining that "even taking into account rhetorical excess, her statement is off in multiple ways." This entry was posted in Politics and tagged Politifact. Bookmark the permalink.